You won't want to be in a rush when you drive the Needles Highway. As part of the Peter Norbeck Scenic Byway, the Needles Highway stretches 14 miles through granite structures and pine covered mountains. 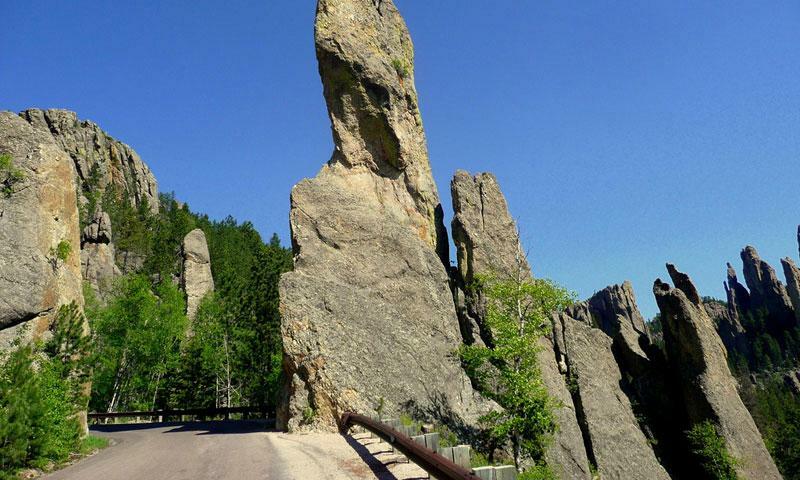 Located along SD-87, Needles Highway cuts through Custer State Park. This narrow road winds among some of the many granite needles that this area is famous for. $20/vehicle entrance fee to Custer State Park. Weather dependent, but typically open from early April to mid-October. Don’t be surprised to find yourself driving slower than your 98-year-old grandmother along Needles Highway (located along SD-87) – the surrounding scenery and wildlife have a tendency to capture the imagination and delight of everyone who come through this area. But don’t worry about hurrying, either. The narrow, windy roads and tunnels primarily attract tourists and sight-seers looking to take their time among the pine and spruce forests and open meadows of the Black Hills. Sylvan Lake and the Needle’s Eye are two spots well-worth stopping for. Sylvan Lake is a picturesque lake set among hills, trees and large granite outcroppings. In addition to hiking trails, the lake is perfect for cooling off in. The Needle’s Eye is one of the most memorable granite needles along the drive, with its signature ‘eye’ formed by countless years of rain, ice and wind. RVs and vehicles with large trailers may want to avoid Needles Highway. Due to snow, the Needles Highway is closed during the winter. It is typically open for driving from ealy April through mid-October. If you want to be sure it's open during your visit, visit the South Dakota DOT and look for information on US-87. 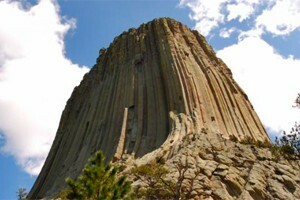 There is a $20/vehicle or $6/person entrance fee for Custer State Park and Needles Highway. You may also purchase an annual pass for all South Dakota State Parks for $30. From Custer, South Dakota, take US-16 Alt 8 miles east to SD-87. Take SD-87 North along Needles Highway. Check out this fantastic map of the route from America's Byways. Plan on spending at least 45 minutes and up to just over an hour to travel the 14 miles of Needles Highway. Signature granite ‘needles’ rise out of the surrounding landscape of the Black Hills. The Needle’s Eye is unique among these distinct rock formations, and Needles Highways passes right past it. Sylvan Lake is one of Custer State Park’s highlights and a beautiful spot to stretch your legs while hiking or playing in the water. 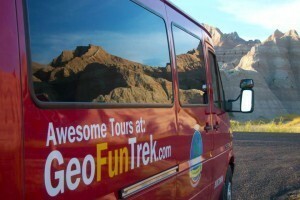 Mountain goats, bighorn sheep, deer, bison, elk and more wildlife of all types can be found all along the highway.